"A quick and simple grilled pork chop that everyone will love featuring a simple and easy glaze." Whisk ketchup, honey, soy sauce, and garlic together in a bowl to make a glaze. Sear the pork chops on both sides on the preheated grill. Lightly brush glaze onto each side of the chops as they cook; grill until no longer pink in the center, about 7 to 9 minutes per side. An instant-read thermometer inserted into the center should read 145 degrees F (63 degrees C). 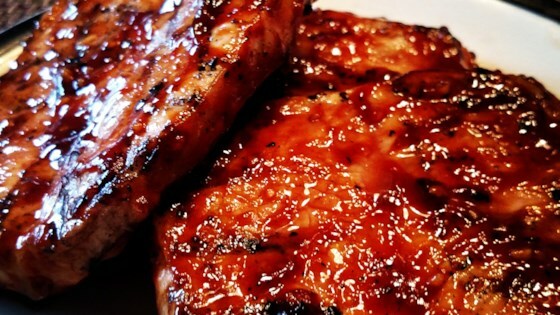 A quick and simple grilled pork chop that everyone will love featuring a simple and easy glaze! I just made this but baked them in the oven at 375.. Turning a few times and adding more sauce each turn, came out amazing juicy and delicious! BEST ever! The only thing I would have changed is that I would hve marinated them in the sauce prior and made extra for dipping...because it was THAT good!